Photo Courtesy of Erin N. Bush, Death in Diorama. Every year, police officers from around the world gather for the Harvard Associates in Police Science (HAPS) Seminar. During the three-day event, the officers attend lectures and participate in workshops covering such macabre topics as “Homicidal Drownings” and “Investigation of Deaths of Infants and Children.” To face the worst of mankind’s dark side requires a certain sense of detachment and steeliness that not just anyone can muster. So it’s a surprise that the founder of HAPS—and some would argue the most important figure in the field of modern forensic analysis—was a 67-year old grandmother who liked to make dolls. Frances Glessner Lee. Photo Courtesy of the National Library of Medicine. Frances Glessner Lee was born in Chicago in 1878 to John and Frances Glessner. Mr. Glessner was the vice president of International Harvester, a company that manufactured farm machinery, so the family lived in the lap of luxury on the Windy City’s lakefront. Home schooling was common among the social elites, and the finest tutors taught Frances and her brother, George. Frances especially excelled in her studies, and hoped to go on to practice either medicine or law. When she wasn’t hitting the books, Frances was learning more domestic skills, like sewing, knitting, interior design, and painting, which she took to with a similar enthusiasm and skill. When it came time for the children to attend college, George was sent directly to Harvard to pursue his degree. Frances’ dreams, on the other hand, were dashed by her father, who insisted she follow the path of a respectable heiress. At 19, Frances Glessner became Frances Glessner Lee when she married up-and-coming lawyer Blewett Lee. The couple went on to have three boys, but the marriage was not a happy one. After a lengthy separation, Frances and Blewett divorced in 1914. In her 20s, Lee met a friend of her brother’s named George Magrath. Magrath was studying medicine at Harvard with plans to go into the relatively new field of legal medicine. After hearing Magrath’s stories of solving crimes using scientific analysis just like her favorite literary sleuth, Sherlock Holmes, Lee became intrigued by the field. Over the course of many years, with Magrath’s guidance, Lee became a self-taught crime scene analyst. Using her wealth and social influence, she was able to acquire books, attend lectures, and gain access to autopsies, crime scenes, and other places laypeople were normally not allowed. Although she was never officially involved in a case, her opinions were respected and appreciated by the officers in charge, to the point they often called her “Mother” Lee. After her brother died in 1930, leaving Lee in control of much of the family fortune, she became a benefactor to Magrath and the field of forensic science. Lee helped establish Harvard's Legal Medicine Department with a $250,000 endowment (about $3.8 million today), and founded the school's Magrath Library in 1936 by donating 1000 crime scene analysis books and manuscripts from her vast personal collection. Not only did Lee champion the field of forensic medicine, but she also broke new ground for women. In 1943, the New Hampshire State Police made her an honorary captain, the first woman to hold the position. Additionally, she was the first female member of the International Association for the Chiefs of Police, and of the American Academy of Forensic Sciences. Although Magrath died in 1938, Lee continued the mission by establishing HAPS in 1945 and hosting its now-famous training seminar. Lee personally organized the event, from selecting the seminar topics to booking lecturers, and even oversaw every detail of the formal dinner party that closed out the conference. Despite all of these accomplishments, what Lee is perhaps best known for are her disturbing dollhouse dioramas. Around the same time that she was busy starting HAPS, Lee heard a common complaint from many young officers trying to learn crime scene analysis: there simply weren’t enough crimes to analyze. To solve the problem, Lee turned to a hobby she had enjoyed for many years—creating miniature dioramas. Dioramas were a common hobby for women in the early part of the 20th century, especially for wealthy heiresses with a lot of time on their hands. One of Lee’s first forays into the craft was a miniature scene featuring the Chicago Symphony Orchestra, built when Lee was 35, as a gift for her mother. Lee spent two months creating 90 musicians, each in hand-sewn clothes, playing tiny sheet music with hand-made miniature instruments. Photo Courtesy of Susan Marks. For the macabre miniatures, Lee created composite scenarios taken from real-life crimes, accidental deaths and suicides, and combined them with anecdotes from police officers, medical examiners and morgue workers. She also recreated cases described in her many field books and manuals. 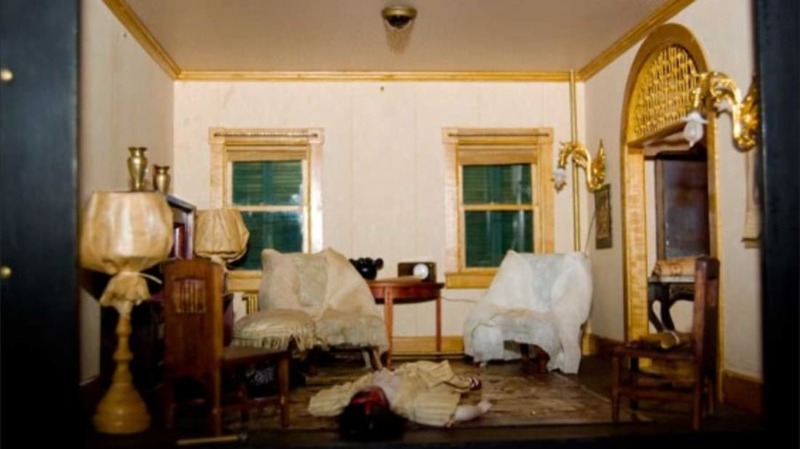 Using these pieces, she would construct one-inch-to-one-foot scale rooms, completely enclosed in glass to preserve the integrity of the scene, where a mysterious death has occurred. The victim dolls were all hand-made and decorated by Lee, who spent countless hours getting every piece just right. She cut and sewed all the clothes by hand, even going so far as to knit tiny socks with straight pins to make them as realistic as possible. Lee also painted each victim to represent scientific clues, such as the level of decomposition that would be expected on a body that had been left undiscovered for a few days. Lee also painted unique clues on the dolls, such as tiny bite marks left by an assailant. To ensure the scene was complex enough to be realistic, Lee overstuffed it with props that might be important to the case. For example, many Nutshells include details like tiny hand-rolled cigarettes, accurate dates on hand-painted wall calendars, scale-model clothespins whittled from wood, medicine bottles with hand-painted prescription labels, little envelopes complete with little stamps, and date-accurate headlines on miniature newspapers. These were in addition to the instruments and decorations of death, like tiny, bloody knives, or blood splatter patterns on the wallpaper. The scale rooms and furniture were mostly made by craftsman Ralph Mosher and his son, whom Lee hired to work on the Nutshells full-time. Like the props, the rooms and buildings were incredibly detailed, down to working shutters, blinds, light switches and bulbs, and tiny keys for tiny locks on tiny doors. One of Mosher’s most famous creations, a Nutshell called “The Burned Cabin,” took the craftsman months to construct, only to have the interior scorched by a blowtorch to provide accurate evidence of a fire in the room. Despite the countless hours spent on each one, Lee and the Moshers were able to complete two or three Nutshells every year. The dioramas were donated to Harvard for use in both the classroom and at the annual HAPS seminars. Before studying the physical evidence in the diorama, students were given a witness’ statement, but the rest was up to their sleuthing and scientific skills. Although every Nutshell has an official solution to the mysterious death, the purpose was not to necessarily have a trainee solve the case. It was more important that students learn how to observe and analyze the scene using a scientific approach. Even if they couldn’t solve the case, presenting a thorough list of evidence analysis was considered a major victory. Lee died in 1962 at the age of 83, but the 20 Nutshell Studies she made were used at Harvard for HAPS seminars and as teaching aids until 1966, when Harvard’s Legal Medicine Department was dissolved. But Lee’s legacy lives on, as the surviving 18 dioramas are currently housed at the Baltimore Medical Examiner’s office, where they are still used for training future crime scene analysts. To see more of the Nutshells, check out Erin Bush’s excellent “Death in Diorama” website.